The National Law Review's editors screen and classify breaking news and analysis authored by recognized legal professionals and our own journalists. Do You Have a Print Edition? The original NLR started in 1888 - but currently operates in an on-line only format. Our on-line platform was developed by in-house attorneys and is operated by attorneys and journalists. Why Publish with NLR vs. other Journals? We're one of the highest volume business law publications in the U.S.
NLR uploads and promotes your firm's author profiles, events and educational content for a flat annual fee of $4,499. Superior results, an outstanding value. 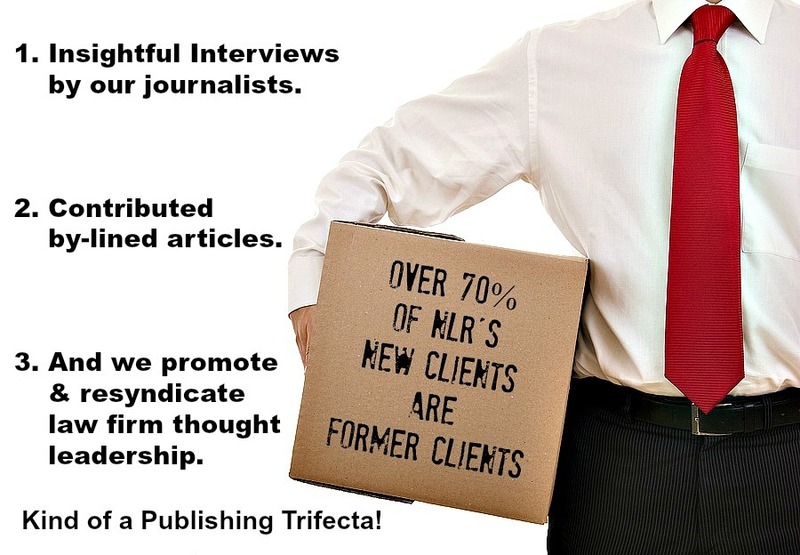 How Does the NLR Promote Its Client's Thought Leadership? NLR's content is featured on professional association websites,government and corporate intranet services, Google News MSN, Yahoo, Bing and many other news services, and is picked up daily by mainstream media and bloggers. Articles can include embedded video for enhanced impact. On-site live analytics and reports provide detailed insight on readership, key words, other media citing your content and other useful tidbits about your firm's content. NLR promotes our publishers content through direct mail, regular newsletters and partnerships with prominent associations. NLR's platform keeps content available and easily accessible to legal consumers for up to two years. What Do NLR Publishers Think? "Since we began working with the National Law Review we have seen an uptick in both article and biography views, and have also had potential clients reach out to us because of an article's appearance on the site." "We are extremely pleased with our National Law Review relationship. NLR provides outstanding service, assistance, and responsiveness. It also is extremely effortless and turnkey to get our attorneys’ articles posted on the NLR site." "We love working with a news service founded by attorneys, is women owned and is U.S. based and operated."